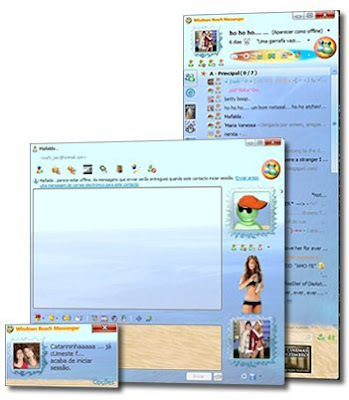 Windows Beach Messenger is a full skin for Windows Live Messenger 8.5. In order to use this skin you may need to install Messenger Plus! Live plugin first. - A menu with useful shortcuts. - Contact card more useful. - While you're logging in, you can select your status with only one click. - Shortcuts in windows to change your status with only one click. - Contacts' list can have tiny user tiles. - You can select/copy the nick on top of conversation window and contact cards. - Change display picture by clicking on your picture (contact list). - Custom background of conversation window is for all window. - Options to customize the skin.